Is the educated consumer actually the best customer? When it comes to healthcare, the jury is still out. The healthcare world is trying to create better customers. More information is made available for the inquiring purchaser. This information can be confusing and inadequate — perhaps even misleading. And, when such information is used, it can be belittled as coming from the internet and not from a ‘reputable’ source. The word ‘customer’ is misleading because the digital patient is much more than that. A customer is an independent evaluator of different markets and services and is armed with sufficient information and the reviews of other customers. Few digital patients have the information needed to be an educated customer. Even if this information is available, the transition from a customer to a patient stands in the way of rational and knowledgeable thinking. People stop being customers once the stethoscopes hit. Most people are objective until it really matters. The challenge for the healthcare industry is to help make customers better able to manage the information gathered from a variety of sources, both within and outside of the organization. It is a matter of teaching the customer many things: proactive healthcare, symptom recognition, medical care provider and treatment plan decisions and what to expect from a confusing healthcare system. 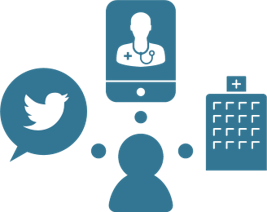 Once a customer becomes a digital patient, it is important for the industry to reinforce the knowledge base and increase the level of engaged decision-making the patient can participate in. The most critical task of IT in the educated customer to digital patient transition is to cut through the clutter and fog of conflicting information to get to the most important facts the patient wants and needs. Because each patient is different, it is necessary to have a range of information available to help the unique needs of each individual. In the end, it is about making customers better to enable them to be better digital patients. This is the third in the series of articles addressing the digital patient and how to solve the healthcare ecosystem’s response to a more complex and demanding audience. Please subscribe to our blog to stay tuned. You may also reach out to EC-United Executive Partner Robert H. Booz (rhbooz@ec-united.com) for more information.